How to add, edit, and see notes about customer accounts. Customer notes let you keep reminders about specific customer needs. Does your customer want all of his books bagged and boarded? Is she always on the lookout for the latest Sandman appearance? Write a note and it will appear everywhere. You can also add a custom ID to a customer, if you have a special box number system, or they have an ID in another system you use. To add a note, edit your customer and scroll down to the “Notes” area. You can add an ID in the Custom ID box, and a note in the Notes box. 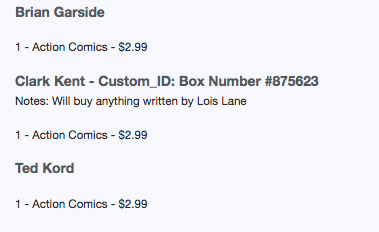 These now show up on the Customer Lists, and on the weekly pull lists.